Reading the new book Listen: Five Simple Tools To Meet Your Everyday Parenting Challenges is a little like visiting an amazingly caring, honest and helpful parents’ group. Hearing the stories of other parents, readers will feel less alone with their parenting struggles. Parents will also feel deeply understood by authors Patty Wipfler and Tosha Schore, who know parenting and families inside and out. They are down-to-earth and funny, like when they comment that when our children have big upsets, it’s like they are taking “emotional poops.” But Wipfler and Shore also take very seriously the lack of support that exists for all families and the strains that poverty, racism and other oppressions put on parents. The authors are compassionate toward every family and offer practical perspectives and information which you can try at home today. Throughout the book, you will find reassurance that there is hope, and that you and children are all good people, not to blame for the struggles you face. The premise of Listen is that parenting is emotional work and our children will thrive when they feel their emotional connection with us. We parents love our children. But we aren’t always able to connect with them. Our time is pressured, and their needs seem endless. We want them to be happy, safe and (fill in the blank), but we become short-tempered, we worry, we feel judged, and then we blame, punish or threaten our children. Listen offers understanding and respect for how hard parents work and how much we love our children and want to do right by them. The authors present thoughtful explanations for how we end up with these parenting challenges that feel so frustrating, confusing, and at times unbearable, offering five Listening Tools to overcome the barriers to connecting with our children. The book brims with stories of parents using the Listening Tools to resolve a multitude of everyday challenges such as morning routines, mealtime, sibling relationships, separation, homework, doctor visits, bedtime and sleep, just to name just a few. Wipfler and Schore assert that “with good tools and an understanding of the importance of connection, you can clear a path to warmth, fun, laughter and sweeter times in your family. It takes work, but that’s all it takes. Magic is not needed. You can learn to do it day by day. Connection is the key. Connection, and your strong will to love well.” I can testify based on my own experience that using these Listening Tools is a daily practice which takes effort, but yields great benefits. I can’t say what state my family would be in today without these five Listening Tools. I’m not sure my marriage would have lasted. I’m not sure my son would be happy. Thanks to these Listening Tools and the people who have helped me learn to use them, I am happy with my family life and have a close and trusting relationship with my teenager. Those already familiar with the Listening Tools will still learn from the depth of the explanations and the range of situations covered in the book. Even after using these tools myself for over 15 years, I found a story in the book about reconnecting after a separation that gave me new insight. Although my son and I usually reconnect well after being apart for work or school, after a trip separated us for days, we had an interaction which took me by surprise and left me feeling stung. In another parent’s story, the principle was there with the reminder I needed–after a separation, sometimes children show us that they are feeling disconnected, and need our help to reestablish their sense of connection. Given the realities of parents’ lives, Wipfler and Shore wrote the book so that it can be read in 10-minute chunks. The introduction includes instructions for “How To Use This Book.” (For parents who want immediate help with a particular challenge, start at Part III!) Part I covers the Hand in Hand perspective on parenting and how children’s emotions work. Part II introduces the five Listening Tools, four of which are for parents to use with their children, and one that is a parent-to-parent Listening Tool. In part III you will find over 100 stories of parents who have used the Listening Tools to address challenges with their children, or in the their own emotional lives. Finally, Part IV offers steps for moving forward with these Listening Tools. The book ends with a hopeful perspective that when parents have the support we need and take leadership in our communities, everyone benefits. 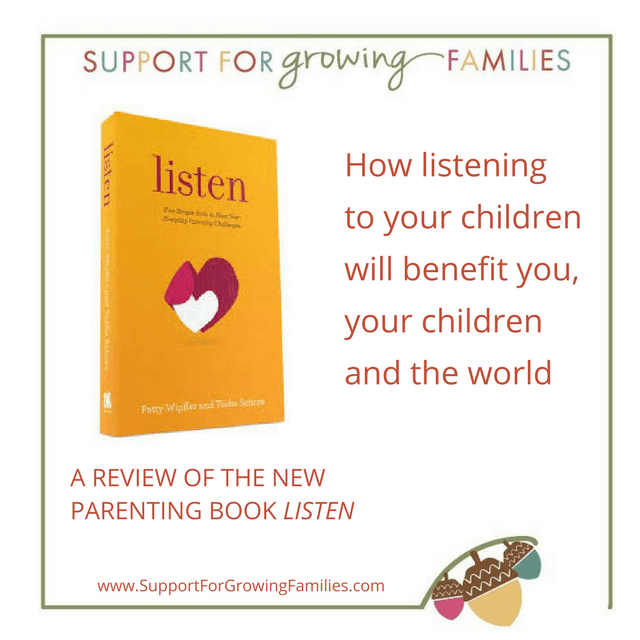 Listen is a book for any parent who is willing to put the work in to learn to listen to their children more deeply, and to build the support they need for their own parenting. Given what I know about parents and how we will do anything for our children, I would say that makes this book for every parent. You just need to know that you can do it, and have the information you need. And that, I think, is why Patty Wipfler and Tosha Shore wrote this book. Listen is available from Hand in Hand Parenting.org and locally from Crazy Wisdom Bookstore. Patty Wipfler and Tosha Schore, M.A. Courtesy of the Crazy Wisdom Community Journal. This blog was first published on October 28, 2016, on the Crazy Wisdom Journal Blog.